It began its activities in 2006. The family's desire to expand its tourist business in the region and offer quality in terms of accommodation and services has made this Apart-Hotel in Mariscal, Bombinhas. Today, with more than 10 years of experience, we are a reference in the region occupying prominent positions in search and reservation hotel sites. We have a loyal clientele that every year brings us their family and friends to enjoy their deserved rest here. Designed to offer maximum quality, comfort, safety and fun. Every day our staff wakes up early to make your stay a pleasant and unforgettable time. Designed with the aim of making our guests feel like they were at home without forgetting leisure and gastronomy options. Totally seafront also provides easy access to the beach. The Morada Guaruçá is located facing the Mariscal Sea, at Rua Aroeira da Praia, 2333 in the city of Bombinhas in Santa Catarina. 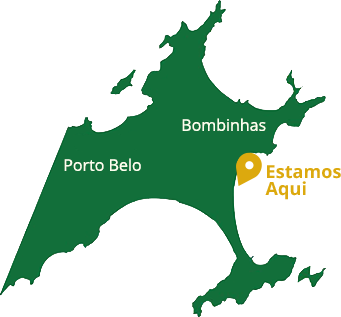 Follow the Avenida Leopoldo Zarling, the first one on Bombas beach when you arrive in the city, almost at the end turn right on Avenida Falcão that connects the beaches of Bombas and Zimbros. At the third roundabout in the neighborhood of Zimbros where there is a gas station just follow the left on Maracujá street that in a few kilometers changes the name to Girassol Avenue. From there, follow the street Canela, where on the corner there is a Marina de Barcos. Enter on the left and go to the end. Turn left at the roundabout and drive another 500 meters approximately. 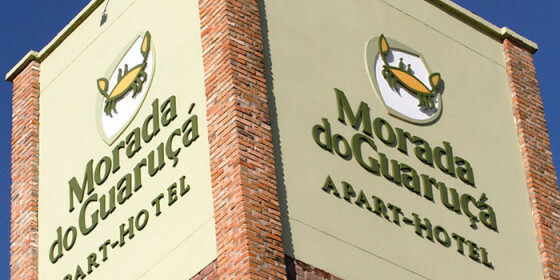 Arrived at Morada do Guaruçá. By selecting the shortest route on the GPS you will probably be directed to go through the Jungle Hill. This course is a bit shorter and sometimes faster. However, if you do not want to take a stretch of dirt road that often due to weather conditions and lack of maintenance is in bad conditions of running prefer to come by accesses 1 or 2.